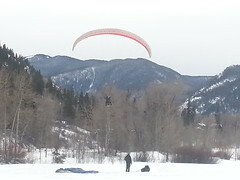 What do après ski and paraglidinghave in common? Not much usually, but they do demonstrate the range of winter Aspen Colorado activities that one can engage in (or at least observe). While après ski in general is one of the most popular Aspen, Colorado activities, some venues are more interesting to me than others. Recently, I was invited to a guest/invite après ski at one of the iconic Aspen hotels the other day, and a Gluhwein Party broke out! At the Mountain Chalet Aspen I found music, laughter, conviviality, appetizers – and of course gluhwein. “…prepared from red wine, heated and spiced with cinnamon sticks, cloves, star aniseed, citrus, sugar and at times vanilla pods…”. The term, glow-wine, apparently comes from “…the hot irons once used for mulling”, but I was told by one of the proprietors that the phrase is also a reference to its propensity for making its imbibers' faces “glow”. All I know is that all of guests at the party seemed to be having a great time and many were really enjoying the novelty of the theme. While I’ve most recently been blogging about my recent indoor activities, I have been getting outside as well, and I got to see some paragliders landing at Northstar Nature Preserve just outside of Aspen while I was doing some cross-country skiing. It’s the first time I’ve taken the opportunity to photograph a landing in sequence. As with the gluhwein party, the participants appeared to be enjoying themselves immensely. These occasions certainly reminded me of the variety of entertaining Aspen Colorado activities - I look forward to the rest of the season!